This is a Universal Aluminum GT Spoiler Wing - Black Type X Style. 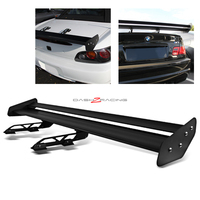 This lightweight aluminum GT spoiler wing will provide greater down force at high speeds without adding a significant amount of weight to your ride, which will provide better handling and cornering as well as a stylish racing look. Comes With All Screw, Bracket And All Accessories! Size: L 51.5" W 11" H 1.5"
Distance between two brackets: 14"